Francesca’s first recipe, Asparagus Baked Pasta, is a fabulous dish for a dinner party —special enough to stand on its own as an entrée or to serve as the pasta course of a multi course dinner. It has the added bonus of being able to be assembled ahead of time and popped in to bake as you are pouring the first round of drinks. Add her second recipe, the Prosciutto and Fennel Salad, and you have the whole dinner party. I will post an easy cheesecake recipe to finish off the night. Let’s face it though…there are nights when all you want to do is crawl into your fuzzy sweater and, yes I’ll admit it, your pajama bottoms and take comfort in a bowl of something delish from your childhood. Something. Something familiar. Something like … Mac and Cheese. Every celebrity chef seems to have a Mac and Cheese recipe. Many are quite upscale and require running around to different stores to find all of the ingredients. There is nothing wrong with that, it just isn’t suited to fuzzy sweaters and pajamas. This recipe, tried and true, came to me from my friend’s mother, Grandma Barbara, who makes tray upon tray of it and then spends the better part of a day running around town to deliver it to her family, her kids, and sometimes her kid’s very lucky friend – me! The success of this recipe lies in salt, deli cheese and Wondra. So, salt. You must salt the macaroni water! Salt the water once it comes to a boil, give it a stir and taste it. It should be salty like sea water. If it isn’t, add some more. This is your only chance to impart some flavor into the macaroni itself. A quick digression about the macaroni – to have the cheese sauce adhere to the macaroni, you want to use a ribbed pasta. At the very least use a ribbed elbow. 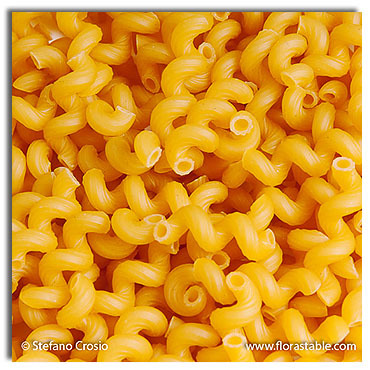 I use cellentani, which is a ribbed, double elbow macaroni that is twisted. It makes for a heartier dish. Deli cheese. Who’d-a-thunk? Seriously, this is the key to the whole dish. Plain old American deli cheese. Now I am a Land o’ Lakes White America, sliced extra thin cheese girl for everything. Everything except this Mac and Cheese. Land o’ Lakes cheese is made with oil so if you use it in this recipe, the oil and the milk solids separate during baking and you get an oily puddle around the edge. Tastes great but looks less than appealing. I have found that Boar’s Head White American, sliced thickly – like an eight of an inch or so works the best. Yellow or white is up to you. Take the extra thick slices and cut them into strips about a centimeter in width and then cut across the strips to create cubes. Last, but not least, Wondra. Wondra might well be one of the greatest inventions of modern cookery. Ok, not really one of the greatest, but really, really good. The fine nature of the flour combined with the shaker top make it super easy to gradually add flour to the milk and butter with one hand, and whisk like a madman with the other. Guaranteeing a super smooth white sauce. I can’t give you an exact measurement for the flour. You just shake it in while the milk boils, and stir and eventually you get a thick white sauce (that you need to salt!). I can usually get 3-4 Macs and Cheese from a canister. In the time it takes to bring the water to a boil, salt it, and cook the macaroni, you can cube and grate the cheeses and make the white sauce. It is ready to throw in the over in under a half an hour OR you can put it in baking dishes and cover with foil and keep in the fridge for a couple of days, OR you can wrap with plastic wrap and foil and freeze to bake later. Just remember to take the plastic wrap off before you bake it. Butter a 13 x 9” baking dish or multiple smaller dishes. Bring the macaroni to a boil in salted water and cook past al dente until the macaroni is soft. In the meantime, bring the milk and butter to a boil over medium heat. While whisking, shake in Wondra and cook until the sauce thickens up. This will take about 10 minutes. If the sauce gets too thick, turn off the heat and whisk in some more milk. Add salt to taste. Drain the macaroni and shake out excess water. Put in a large bowl and toss with the American cheese cubes. Pour the white sauce over the cheese and macaroni and toss well. Turn out into the baking dish(es). Cover the top of the casserole with the grated cheddar. Bake at 375 F for 30-45 minutes until the top is a little crusty and the inside is bubbly and hot. If you are baking a frozen casserole, it will take longer – closer to 45-60 minutes. Just watch it carefully. This entry was posted in Recipes and tagged American, cheese, cooking, Mac & Cheese, macaroni, pasta, recipe on October 19, 2012 by Nicole.